The desperate need for a vast part of the global population to access better medicines in more reliable ways is a persistent social concern. Since the mid-1990s, it has also evolved into one of the most cynical and disheartening aspects of international politics, as we have seen the interests of a few conflict with the needs of the many. The conflicts between the rise of global intellectual property (IP) rights and the deployment of cheap medication for the poor have been extensively discussed since shortly after the adoption of the Trade Related Aspects of Intellectual Property Rights (TRIPS) agreement in 1995. A plethora of academic writings on the topic has been produced and the media have extensively commented (sometimes accurately, sometimes less so) on a subject that has now become familiar to many. However, since starting the research leading to this book in 2002, I have remained convinced that there are too many dimensions of the debate that have been left unexplored. Whilst this book does not claim by any means to provide an exhaustive story of TRIPS, it aims to unpack some of these unexplored aspects, but also to bring together bodies of analyses and questions that have not been confronted with each other in this context. 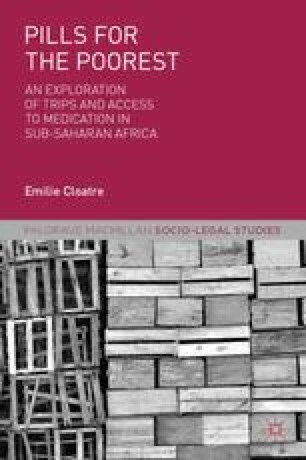 I do this by bringing together qualitative data collected in two states of sub-Saharan Africa (Djibouti and Ghana) and the conceptual insights of actor-network theory (ANT) to propose a socio-legal exploration of the links between IP and access to medicines. I explore TRIPS as a multiple actor, flowing along networks that bring it from the World Trade Organization (WTO) to Djibouti and Ghana, through offices, into drugs, encountering AIDS, malaria, patients and activists on its way. I explore pharmaceutical patents as part of TRIPS, but also as part of materials, including medicines, and as part of the daily lives and practices of many other human and non-human actors, and question the co-constitutional roles of diseases and regulatory politics in the context of IP. I am primarily interested in the ‘small’ and in localized connections, while understanding those as always entangled in events and linkages happening elsewhere. In this process, ANT provides a useful toolbox to analyse the multidimensional interactions between the wide range of actors that is relevant to TRIPS. I have chosen to use ANT in an open and flexible way, and hope not to have betrayed any of its fundamental claims in doing so. Instead, I hope that this book provides an opportunity to question the possibilities and limitations of engaging with ANT in socio-legal studies, and in the study of global legal instruments. Reciprocally, using ANT to explore a particular set of legal tools enables me to question the processes of ordering and production that surround their deployment into new networks, offering an analysis of the law that opens questions beyond these particular case studies.